I made my approach to countertop pickling very slowly. Not sure why, given how tasty soured veggies are (not to mention the long list of healthful benefits packed in each bite). Nevertheless, here I am, experimenting with some of the season’s bounty with a little help from Linda Ziedrich’s book The Joy of Pickling. 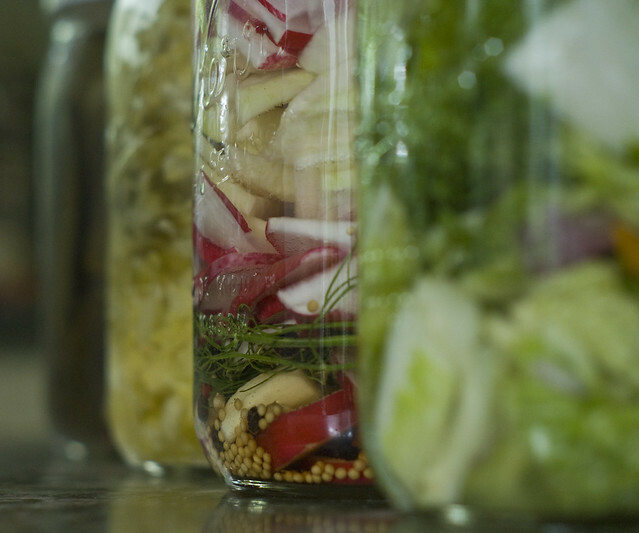 So far this summer (still a bit early, yet, to be taking full advantage of the piles of veggies at our farmer’s market), I’ve been working on some pickled radishes, kohlrabi, kimchi, sauerkraut and some dill cucumbers. The kimchi is still bubbling away, so I can’t say for sure how it will be, but based on what I’ve experienced with the pickled cucumbers and kohlrabi, I’ve got high hopes.